WEST LAFAYETTE, Ind. — Some 700 student performers will take the stage during a series of four concerts Friday through Sunday (April 24-26) at Purdue University. All four concerts are free and open to the public. The first concert is an 8 p.m. Friday (April 24) show featuring the Purdue Symphonic and Concert bands at Elliott Hall of Music. Two more concerts will be offered at Elliott Hall of Music on Saturday (April 25), including a 6 p.m. performance featuring the Purdue Philharmonic and Symphony orchestras and an 8 p.m. show highlighting the University and Collegiate Concert bands. The weekend’s final performance is Jazz on the Hill at 2:30 p.m. Sunday (April 26) at Slayter Center of Performing Arts. The weekend's events will serve as a finale of the 2008-09 performing season for Purdue Bands & Orchestra. 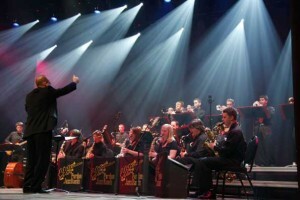 The Jazz on the Hill concert will pay tribute to jazz composer Stan Kenton, with performances by the Purdue Jazz Band, American Music Repertory Ensemble, Lab Jazz Band, Concert Jazz Band and the Jazz Conception Ensemble. The show will be outdoors, and attendees are encouraged to bring blankets and lawn chairs for comfortable seating. The weekend’s events will serve as a finale of the 2008-09 performing season for Purdue Bands & Orchestra.